If there’s a vegetable that can’t be pickled, UVA grad Matt Bressan has yet to find it. 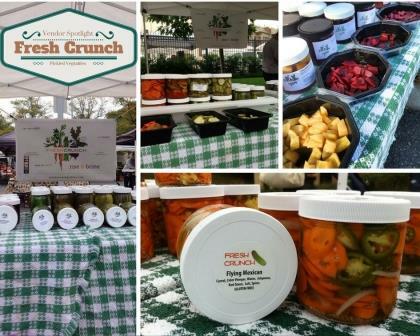 As the owner of Fresh Crunch Pickles, he excels at brining and jarring veggies from crowd pleasing Classic Dill Spears to Citrus-Ginger-Beets to Balzy Carrots to Wasabi Green Beans. Handcrafted in small batches in Falls Church, VA, these unique cold-brined pickled vegetables (and other seasonal local produce) are a market favorite!